This post is sponsored by my friends over at Nielsen-Massey, but all opinions are my own. 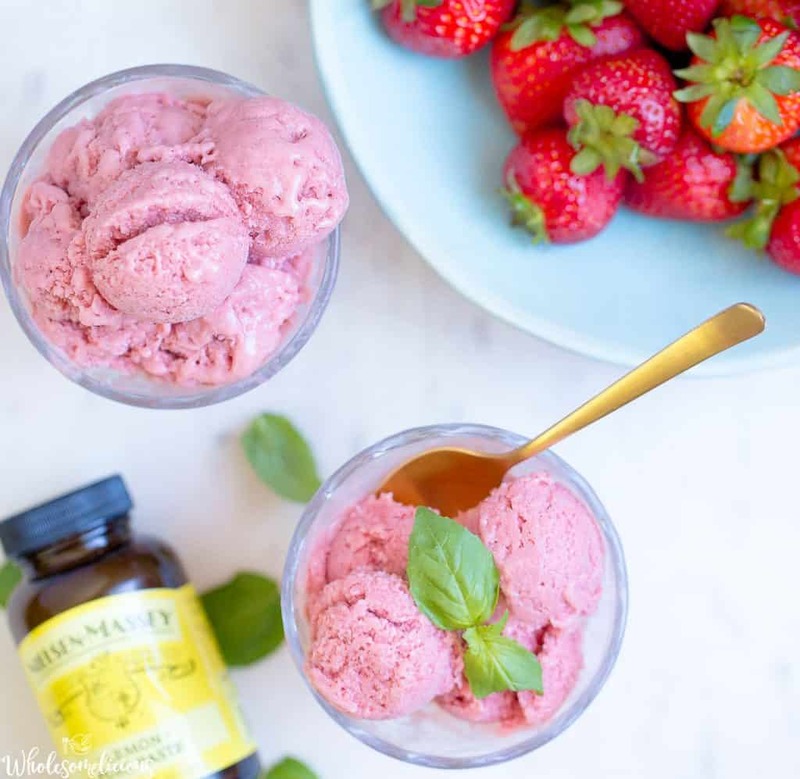 Strawberry Lemon Basil Sorbet is the ultimate refreshing summer treat! 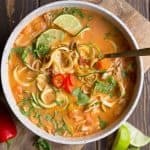 Delightfully delicious, tangy, and packed with fruity flavor that needs to be devoured on a hot day! 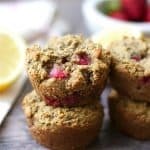 Dairy-free, Vegan, only a few ingredients, and oh so yummy. On a hot day with a power outage in full effect, a big bowl of sorbet makes everything better. Sick kid? Sorbet it is. Scorching temps and a double header baseball game? Let’s have a bowl of sorbet. I’m all out of any breakfast foods…Yes, sorbet is totally a legit healthy meal. I should rewind a bit, and let you know my relationship with sorbet has always been…-lacking. 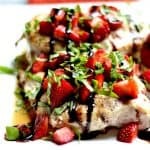 I’m more of an indulgent “chocolate for dessert” kind of gal, even in the hot summer months. 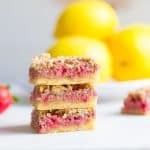 BUT, with pounds of freshly picked strawberries, an obsession with fresh basil, and my recent discovery of Nielsen-Massey’s Pure Lemon Paste, I kicked my chocolate cravings to the curb. Can we talk about how AMAZINGLY delicious this combination is? Not only does it scream SUMMER, but it’s pretty much the only dessert you’ll need to get you through the next few months. 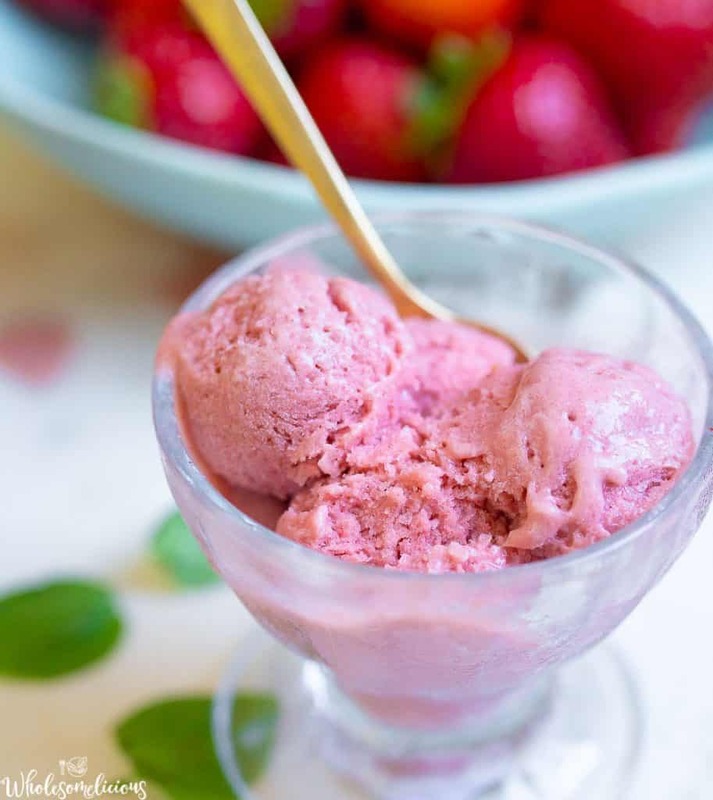 Juicy, fresh, in-season strawberries provide the perfect sweetness, full fat coconut milk gives the sorbet a milky and creamy texture, and the basil lemon taste balances the sweet flavor with some tang! 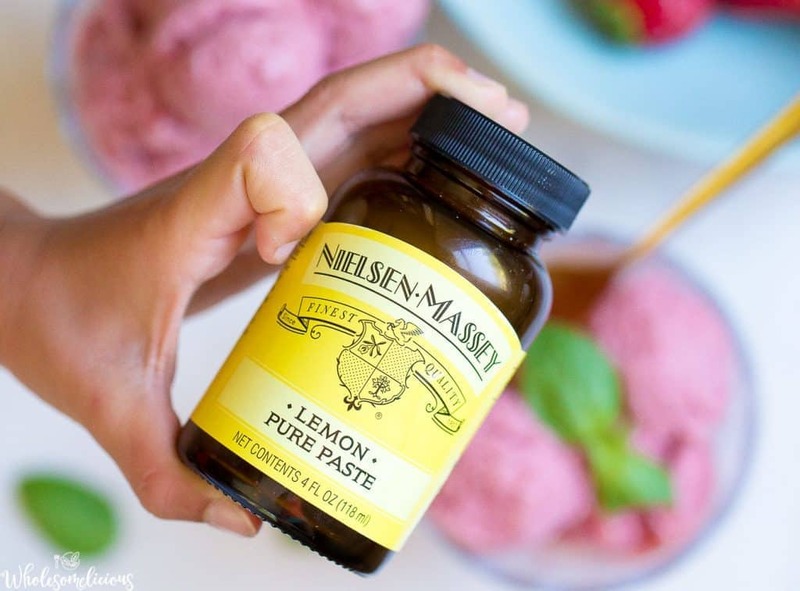 Nielsen-Massey’s Pure Lemon Paste, available for purchase later this month, is one of their new products that I know will have a permanent place in my cabinet. 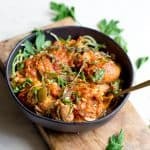 I love that the company is family owned and operated, and their products are all-natural, GMO-free, certified Gluten- Free, certified Kosher, and allergen-free. I keep a stash of their extracts in my cabinet at all times! 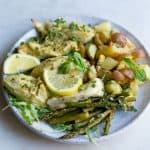 The Pure Lemon Paste elevates and transforms any dish without the need to zest or juice, and it’s made with Nielsen-Massey’s Pure Lemon Extract which contains oil drawn from the natural essence of the highest quality California Lemons. 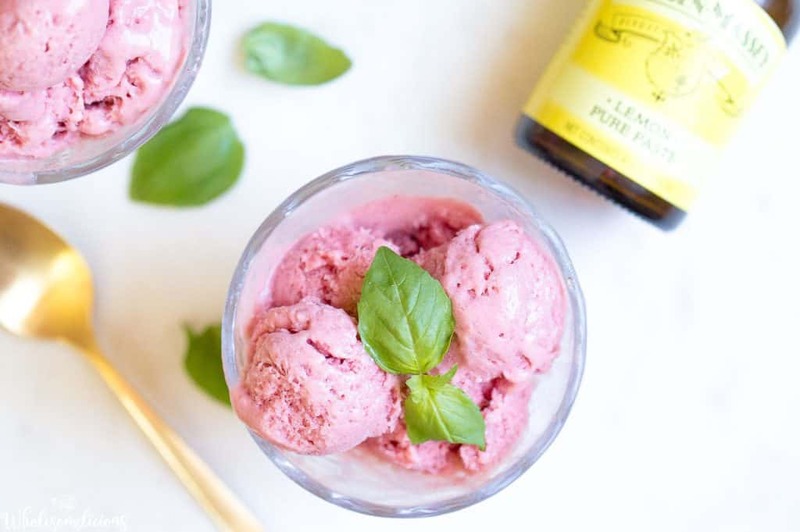 One tablespoon of Pure Lemon Paste is a slightly sweeter substitute for a teaspoon of Pure Lemon Extract, and gives this sorbet a unique flavor profile! 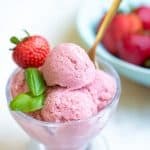 I love how easy this sorbet is to make with a blender and only a few ingredients. 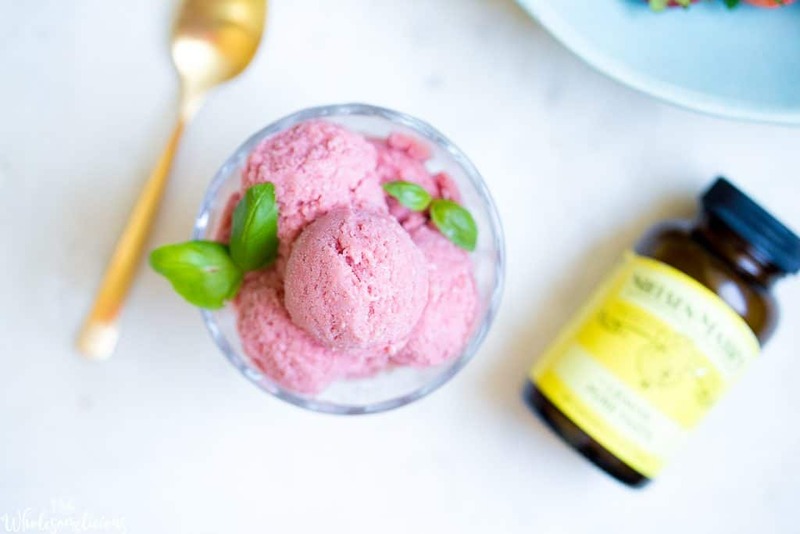 The whole family has been devouring this sorbet by the bowl full! My 8 year old has decided he wants nothing to do with any store-bought ice cream or popsicle, but only sorbet every day as a summer treat. I even caught the husband eating a bowl at 9am, claiming he didn’t want anything else for breakfast. And me, let’s just say I haven’t had chocolate in over a week. Which is pretty much unheard of. Let’s raise our spoons, toast to the middle of July, and dive right into this bowl of pure summertime bliss! 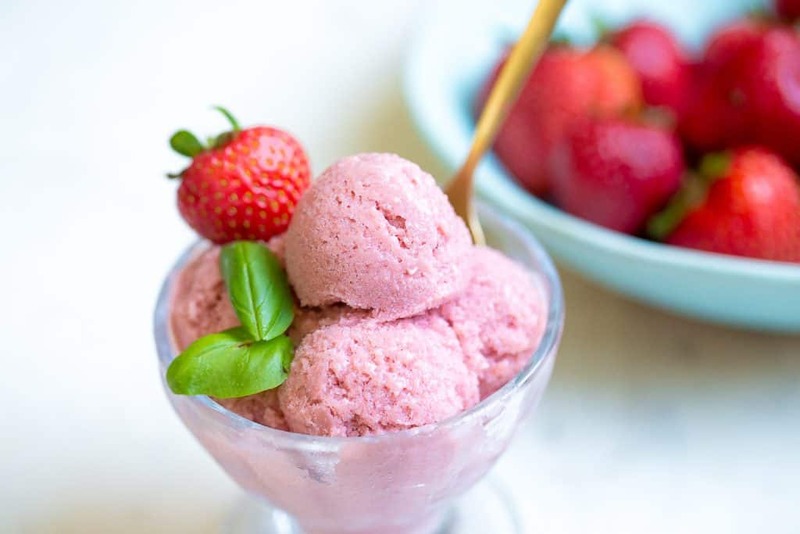 In a food processor or blender, blend strawberries, coconut milk, maple syrup, lemon paste, and basil leaves. Continue to pulse for up to 3 minutes, until completely smooth. 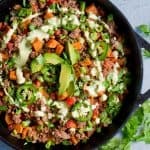 Pour mixture into an air-tight container that is freezer friendly. Freeze for at least 3 hours, up to 12 hours to ensure it is completely frozen. It will need to soften at room temperature for at least 15 minutes until it can be easily spooned. If mixture is a bit icy, continue to soften at room temperature and mix with a spoon.